Kasey (Till) Hale with Treyden, grandchild of Jim Hale, White Owl, South Dakota. Jim bought bulls at the sale. Donald Tomac of Keldron, South Dakota, bought Lot 536 at $9,000. 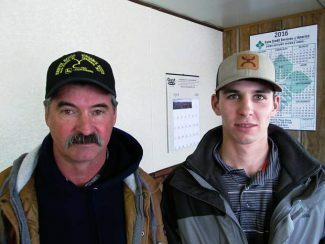 Jim Bird and Bill Gaskill, both from Volborg, Montana. Dan Booth of Ridgeview, South Dakota, Les Lensegrav of Meadow, South Dakota, and Keith Dorsey of Isabel, South Dakota. 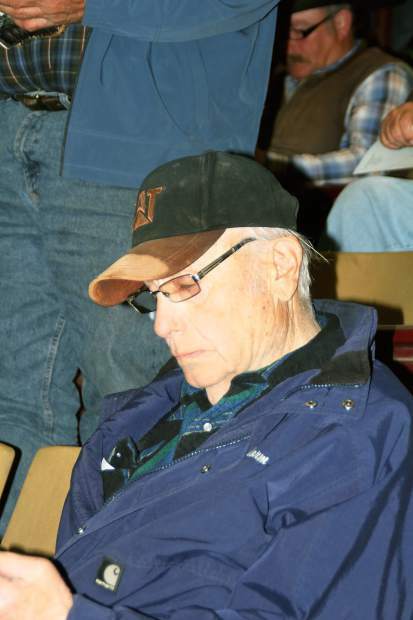 Norman Miles, Meadow, S.D., repeat Wilken Angus bull buyer. 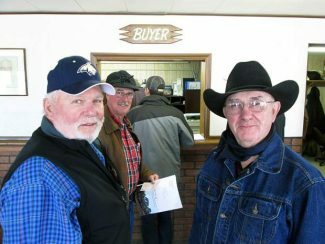 Wilken Angus, owned by Gary and Lori Wilken, and their family, hosted another large crowd for their annual spring yearling bull sale. This firm features Angus bulls that are bred for calving ease. They like easy fleshing females that have good growth and positive carcass qualities. This was a very uniform set of bulls, and so was the demand as the sale stayed very steady all the way through, with many outfits buying multiple bulls. These bulls are sired by proven AI sires that bring the best of America's genetics to these Wilken bulls. All bulls were DNA tested by Zoetis 50K through Angus Genetics and given EPDs by Angus Genetics, Inc.
Gary and Lori offer one of the best guarantees in the business. They have volume discounts, as well as free delivery. 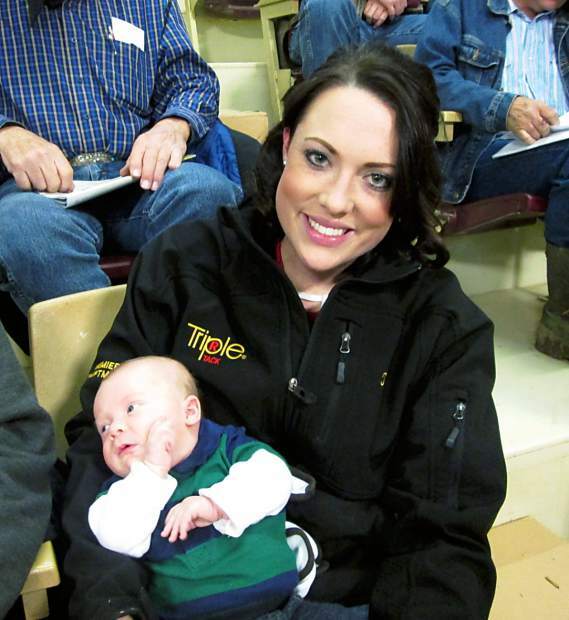 Many repeat buyers were on hand, making for a very competitive sale, especially among the calving ease bulls. Top selling bull of the day honors were shared by three bulls, each at $9,000. 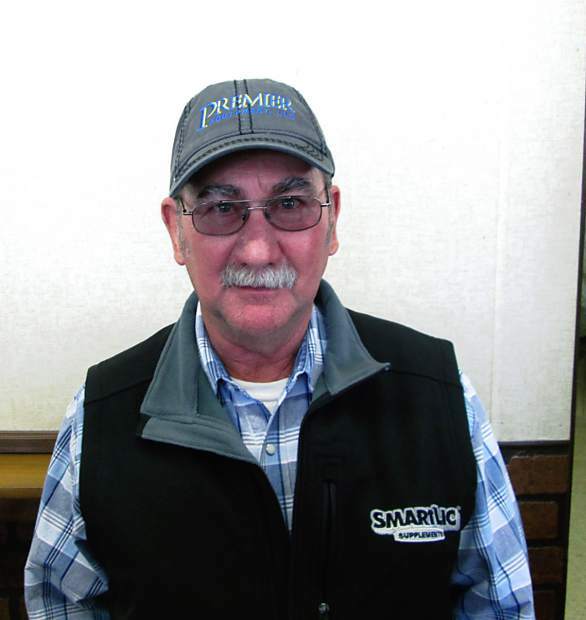 Dale Paulson from Wessington Springs, South Dakota, topped his purchases with Lot 599 at $9,000. He was a son of RB Tour of Duty 177 who was out of a daughter of Connealy Thunder. Born at 90 pounds, he weaned at 743 pounds to ratio 126, and posted a yearling weight of 1429 pounds to ratio 122. His Zoetis 50K Angus Genetics testing confirmed EPDs of CED 10, BW -0.7, WW 63, YW 120, MILK 24, DOC 20, MARB 0.43, and REA 0.61. Repeat buyer, Donald Tomac, from Keldron, South Dakota, chose Lot 536 at $9,000. Here was a son of Barstow Cash, and out of a Game Day daughter. With an 85 pound birth weight, he weaned at 654 pounds to ratio 111, and grew to a yearling weight of 1,260 pounds. His Zoetix 50K EPDs were CED 6, BW -0.3, WW 49, YW 87, MILK 21, SC 0.82, DOC 10, MARB 0.53, and REA 0.27. Lot 522 was a top selection for Susan Wacker from Hemmingford, Nebraska, at $9,000. Sired by Barstow Cash, he was out of a Bushwacker daughter. He entered the world at 85 pounds, weaned at 730 pounds to ratio 124, and reached a yearling weight of 1352 pounds. His Zoetis EPDs were CED 7, BW 0.3, WW 58, YW 100 MILK 26, SC 0.97, DOC 10, MARB 0.27, and REA 0.61. Mickey Simons from White Owl, South Dakota, bought Lot 514 at $8,500. This bull was sired by AAR Ten X 7008 SA, and out of a daughter of Rito 1I2. With an 82 pound birth weight, he weaned at 701 pounds, before posting a yearling weight of 1,331 pounds. This bull was pictured in the catalog, and with his thick top and big hip, he deserved the honor. Susan Wacker also purchased Lot 542 at $8,500. He was sired by Barstow Cash and out of a Predestined daughter. Beginning with a 78 pound birth weight, he grew to 1,306 pounds as a yearling. His EPDs were all complimentary, but standing out was his scrotal EPD of 1.75, along with an REA of 0.65. Lot 5103 sold for $8,250 to Dale Paulson, Wessington Springs, South Dakota. This son of RB Tour of Duty 177 was out of a daughter of Sitz Dash. Born at 95 pounds, he had a weaning weight of 699 pounds, and a yearling weight of 1,321 pounds. The hospitality and food at this sale is incredible, and so is the crowd, as I believe they view the Wilken family as good friends as well as business partners. Watch for the Wilken two-year-old bull sale in December of 2016 at Faith Livestock. Give them a call. I'm sure they would be glad to have you stop out at the ranch to view the bulls on summer pasture.